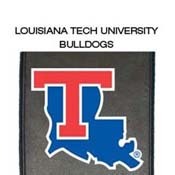 Lounge in your Louisiana Tech Bulldogs Silver Love Seat with a friend and enjoy cheering your Bulldogs to victory. The Silver Series is a perfect choice for looks, comfort and versatility . It features synthetic leather with a hardwood frame, no-sag spring suspension and high resiliency foam. Best of all the logos zip on and off for endless customization. The Love Seat comes standard with two identical logos. Overall Width - Side to Side: 55"